Club meetings samples differ from routine meetings in that they don’t always follow a formal course. It is up to the chairperson of a club meeting to decide how formally he wants it to get rolling. Sometimes, club meetings are held casually so as to engage the participating members and encourage them to unhesitatingly share their views. Although there are myriad ways in which a club meeting can be made successful, experts recommend following an agenda. theracqueteers.org.uk | This template offers rows and columns to add all the details of the meeting. 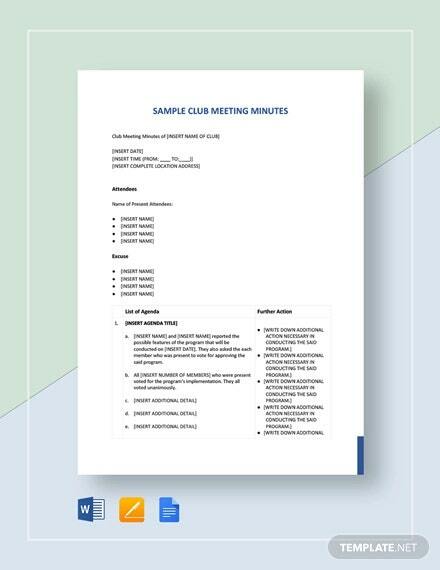 The neat rows and columns make the sample Club Meeting Minutes Template look extremely neat and organized. sportingpulse.com This template helps you keep account of your football club meetings in an effective way. Things get so clear that you never get confused with the content no matter how many months later you give it a revisit. So, opt for a Football Club Minutes Meeting Template and enjoy the difference. 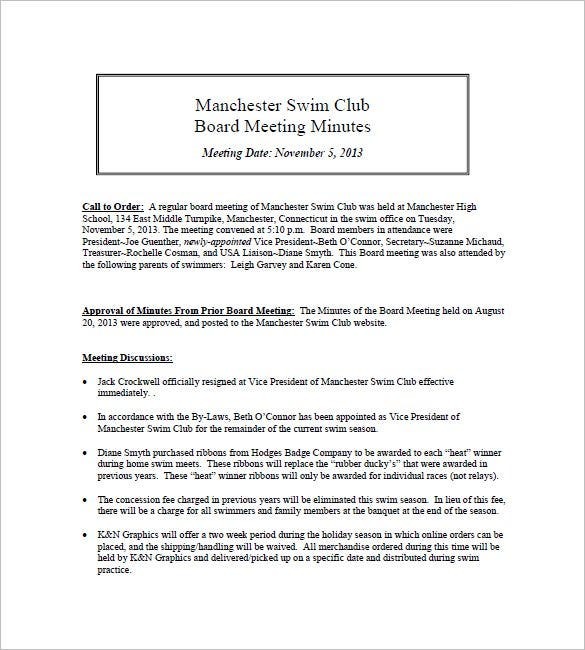 manchesterswimclub.org | If you are part of the local swim club and have been assigned the job of tracking in-house meetings’ developments, then you need these templates. 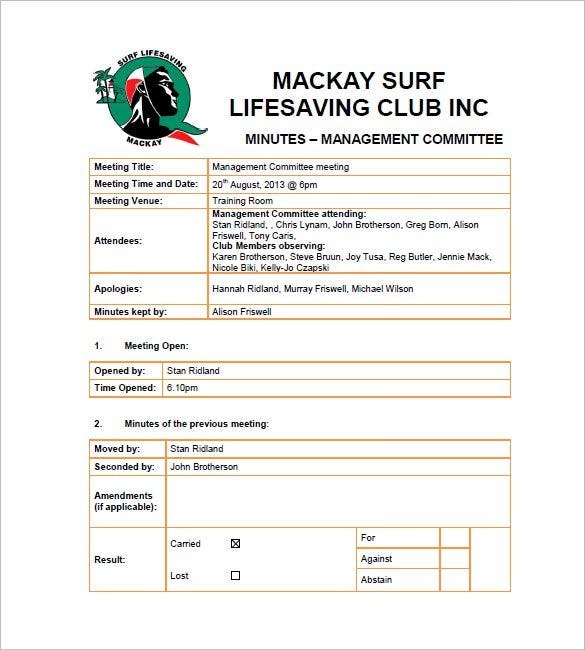 By using a Swim Club Meeting Minutes Template, you get to know what a flawless meeting minutes document looks like. sportingpulse.com | Sports club meetings are generally lengthier as they discuss different sports. And therefore, developing a minute-by-minute account of such a meeting is difficult. 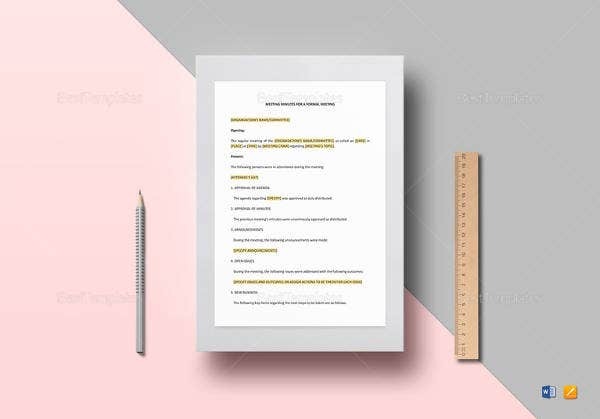 You can, however, turn this seemingly difficult job into a breeze by referring to a Sports Club Meeting Minutes Template for ideas. 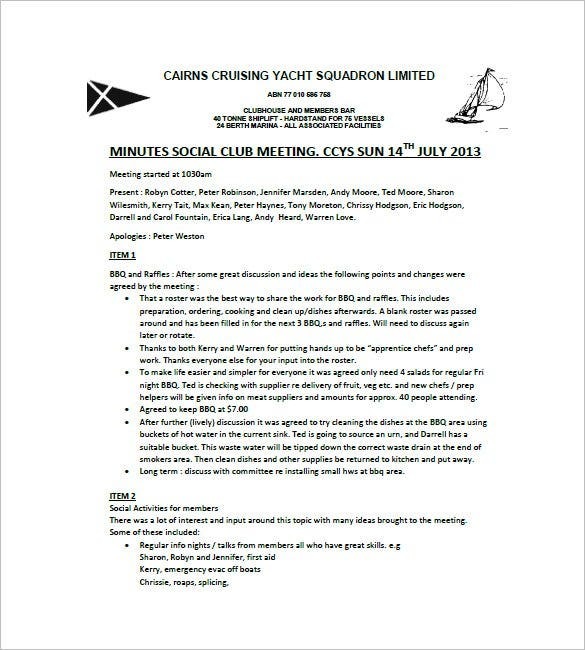 ccys.com.au | These meetings are even harder to track, primarily because of the uproar they often create. 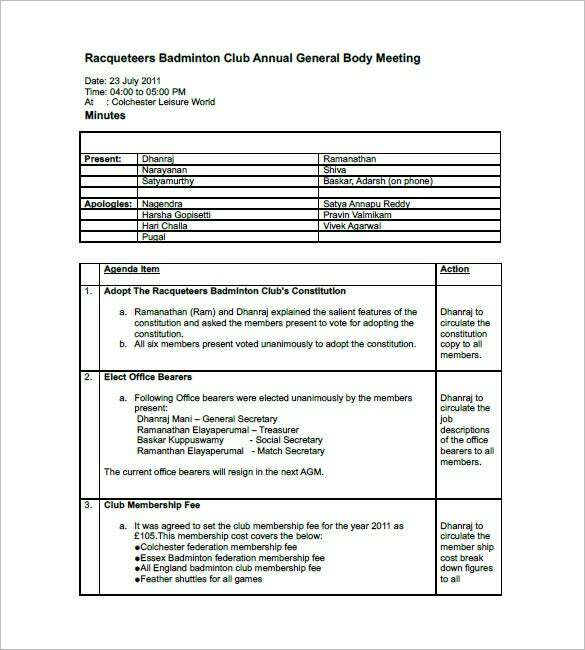 If you are in charge of the local social club meetings’ elaborate documentation, you sure know what to do- take help of a Social Club Meeting Minutes Template. 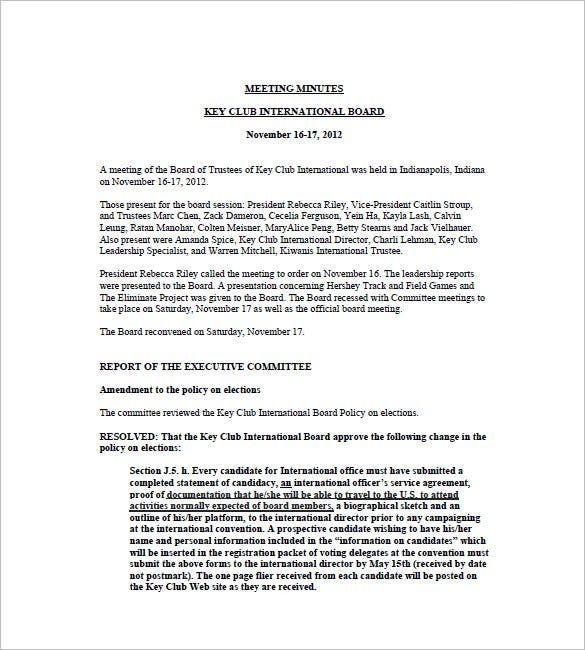 keyclub.org | The format followed by this Key Club Meeting Minutes template allows you to take down information on the attendees as well as the main agenda discussed at the key club meeting. 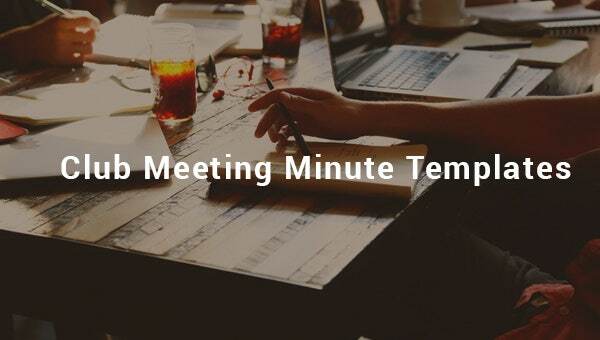 Why meeting minutes templates are so important? Being part of a sports club is not an easy job. A lot of things need to be handled, taking important decisions in favor of players included. In such a scenario, precision and efficacy seem to be the two key qualities you must have to get things done. 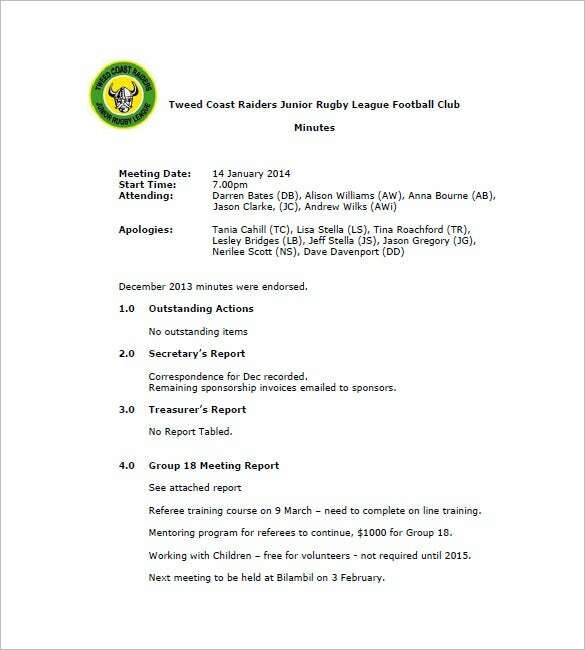 Things get tougher when you are asked to prepare minute-by-minute accounts of the club’s meetings. While it is understandable that you find this job challenging, you should never stop looking for ways to make it easier. One such way is using meeting minutes templates for reference. They help you create amazing meeting minutes accounts that compel other club members to appreciate them. If this is not success, what is? 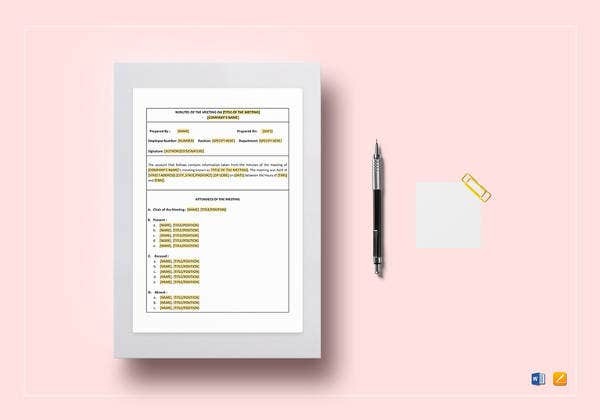 Download these templates easily and put them into use for amazing results. If you are keen on saving a few bucks then you probably should search for websites that offer free services. But in case, you prefer quality over economy, then choosing from an array of websites offering paid download would be ideal. 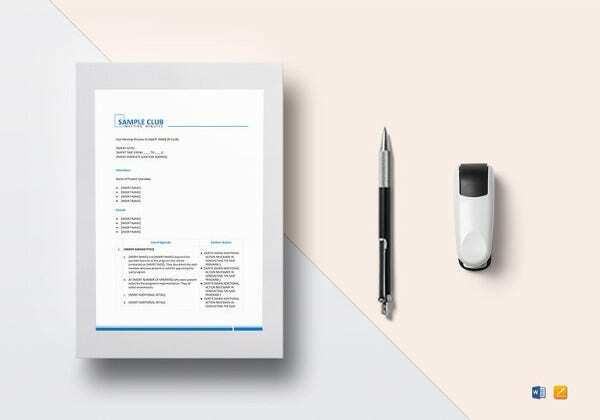 The print quality these templates offer is flawless and you get value for money. If you have any DMCA issues on this post, please contact us!